Hailing from Arctic Canada, The Jerry Cans are passionate about two main issues: keeping the Indigenous Inuktitut language and culture alive and getting everyone dancing to their infectious music. For their Sunday afternoon WOMADelaide performance they definitely achieved their goals. Described as a cross between The Clash and The Pogues, The Jerry Cans have adapted traditional throat singing and mixed it into contemporary roots music. Added to this is the violin, which brings a Celtic flavour, while the drum, bass and acoustic guitar add the southern American rock guts to the sound. Apart from a few songs in English, the majority are sung in the Inuktitut language about everything from one of their parents passing away to eating seal meat. The Jerry Cans reported the current temperature in their hometown was -36 degrees Celsius today so the hot sunny Adelaide day was a massive contrast for the band. This did not stop the intense energy the band brought to their performance. Singer and songwriter Andrew Morrison leads The Jerry Cans with vigour and speaks enthusiastically about the Artic North of Canada, his partner Nancy Mike and her Indigenous culture. Due to the extended set, the audience was treated to some throat singing lessons by Nancy with an opportunity to hear how it traditionally overlaps; fiddler Gina Burgess, bassist Brendan Doherty and drummer Steve Rigby round out the fantastic band. An absolute pleasure having The Jerry Cans at WOMADelaide and hopefully we will see them down under again very soon. WOMADelaide continues at Adelaide Botanic Park from 11am until Mon 14 Mar. Book at BASS or www.adelaidefestival.com.au. Click HERE to purchase your tickets. WOMADelaide, Novatech Stage, Sun 13 Mar Hailing from Arctic Canada, The Jerry Cans are passionate about two main issues: keeping the Indigenous Inuktitut language and culture alive and getting everyone dancing to their infectious music. For their Sunday afternoon WOMADelaide performance they definitely achieved their goals. Described as a cross between The Clash and The Pogues, The Jerry Cans have adapted traditional throat singing and mixed it into contemporary roots music. Added to this is the violin, which brings a Celtic flavour, while the drum, bass and acoustic guitar add the southern American rock guts to the sound. Apart from a few songs in English, the majority are sung in the Inuktitut language about everything from one of their parents passing away to eating seal meat. The Jerry Cans reported the current temperature in their hometown was -36 degrees Celsius today so the hot sunny Adelaide day was a massive contrast for the band. This did not stop the intense energy the band brought to their performance. Singer and songwriter Andrew Morrison leads The Jerry Cans with vigour and speaks enthusiastically about the Artic North of Canada, his partner Nancy Mike and her Indigenous culture. Due to the extended set, the audience was treated to some throat singing lessons by Nancy with an opportunity to hear how it traditionally overlaps; fiddler Gina Burgess, bassist Brendan Doherty and drummer Steve Rigby round out the fantastic band. 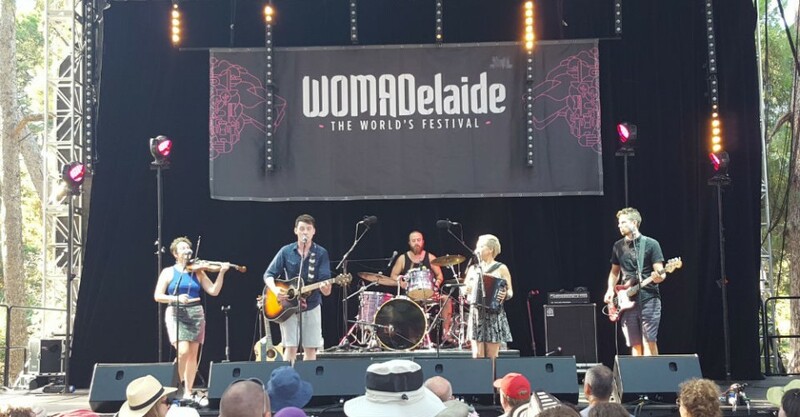 An absolute pleasure having The Jerry Cans at WOMADelaide and hopefully we will see them down under again very soon. Bobby Goudie WOMADelaide continues at Adelaide Botanic Park from 11am until Mon 14 Mar. Book at BASS or www.adelaidefestival.com.au. Click HERE to purchase your tickets.